Discover a mobility scooter that is small in size yet packed with features. The Envoy 4 mobility scooter punches well above its weight in both features and performance, matching that of many larger and more expensive models. 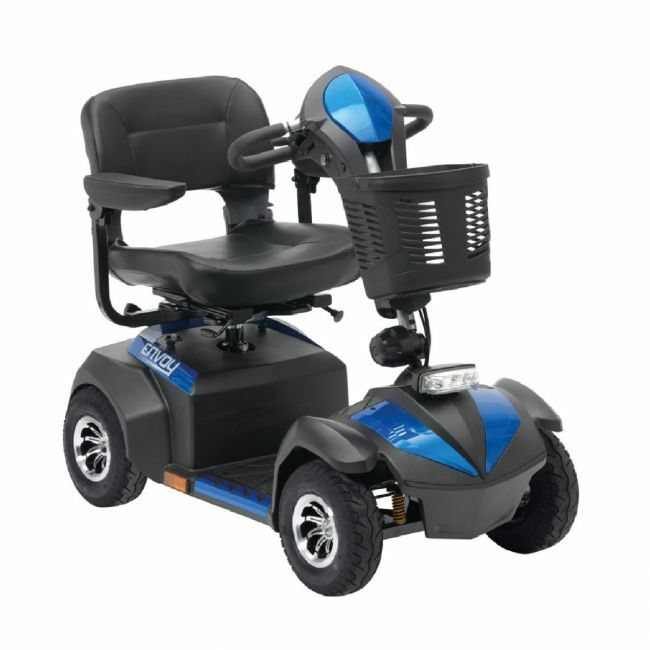 A full suspension system and large tyres iron out bumps in the pavement with ease, and a fully adjustable seat with padded armrests ensure a comfortable and relaxing journey. Performance comes from powerful 350 watt motor to propel this electric mobility scooter up to an impressive 30 miles on a single charge. Other features include LED lights for visibility in poor light, and a weight capacity of 25 stone which tops many of the best mobility scooters for sale in the UK at the moment. Choose from four attractive colours, red, white, silver, or blue. All of our mobility scooters come with batteries and a charger. Please get in touch if you would like to arrange a test drive.